The American cockroach is the largest of the house-infesting roaches. They are most commonly found in restaurants, grocery stores, bakeries, breweries, pet shops and other establishments where food is prepared or stored. They are often found in damp sewers and basements, in heating ducts under hospitals, and on the first floors of buildings. They can be transported into homes and apartments in boxes from infested establishments. 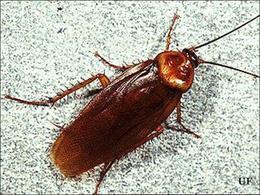 Roaches can foul food, damage wallpaper, books and clothing, and produce an unpleasant odor. Some home owners are allergic to roaches, and these pests can cause childhood asthma or contaminate food with certain bacterial diseases that result in food poisoning, dysentery, or diarrhea. Most cockroaches have a flattened oval shape, spiny legs, and grow long, filamentous antennae. Immature stages are smaller, have undeveloped wings and resemble adults. Adult American cockroaches are reddish-brown to dark brown (except for a tan or light yellow band around the shield behind the head), about 1-1/2 to 2-inches long, and have wings capable of flight. Males and females are about the same size. The wings are about the same length as the body (abdomen) in the females and longer in the males, extending slightly beyond the abdomen. Females have a broader abdomen, while the males have both cerci (pair of appendages at the end of the abdomen) and styli (short, slender, fingerlike process). Nymphs are wingless, uniformly brown colored, and run very fast. Egg capsules are mahogany brown and about 1/3-inch long. American cockroach females deposit their eggs in bean-shaped cases (oothecae) in sheltered areas on or near the floor, usually close to a food source. Egg capsules protrude from the body for a few hours to four days. One egg capsule is formed each week until 6 to 14 have been produced. Each case contains up to 16 white or yellowish-white eggs. Eggs hatch between 5 to 7 weeks, first into whitish-brown nymphs, later turning more reddish-brown. Development to adult averages about 15 months, varying between 9-1/2 to 20 months. Adults live almost 15 months. These roaches are found in dark, moist areas, especially in sewers, steam heat tunnels, boiler rooms, around bathtubs and clothes hampers, and around plumbing, feeding on decaying organic matter. Many are attracted to fermenting liquid (bread saturated with beer). Feeding can occur on starch sizing in books, papers, etc. Cockroaches hide during the day in sheltered, dark places and forage for food at night, often running rapidly when disturbed. American cockroaches are one of the least common roaches found in homes and, though winged, seldom fly when disturbed. Instead, there is more of a gliding flight. Adults can live at least two to three months without food, a month without water, and can easily survive outdoor freezing temperatures. Some have been found in alleyways and yards in summer months and around street lights. American cockroaches can be detected by examining the premises after dark with a flashlight. They occur in dark, damp, warm places, often near steam pipes, in sewers, grease traps, damp basements, etc. During the day, probing hiding places with a wire will expose roaches. Household sprays of pyrethrins applied to hiding places will flush out roaches, sometimes killing them if they contact the spray. American roaches can move from one building to the next during the summer, entering through cracks in foundations, around loose-fitting doors or windows, and along water and gas pipes. Seal openings with putty or plastic wood. Inspect sacks, cartons and boxes, etc., brought into the home and destroy any roaches. Sanitation is critical in roach control. Clean up spilled foods and liquids, avoid leaving scraps of food on unwashed dishes and counter tops, keep food in tightly sealed containers, rinse cans and bottles before putting in trash and transfer garbage outdoors into roach-proof receptacles.